The Louisiana Sea Grant College Program hosted its annual educational, coastal-based event, Ocean Commotion, on October 27 at the LSU Pete Maravich Assembly Center in Baton Rouge, La. The primary purpose of Ocean Commotion is to give students the chance to learn about and touch the products of the sea and coast—the aquatic animals, plants, and minerals—upon which Louisiana’s citizens are so dependent. In attendance were 2,138 K-8 students, 121 teachers and 139 chaperons from East Baton Rouge, Iberville, Jefferson, East Feliciana, and Assumption parishes. 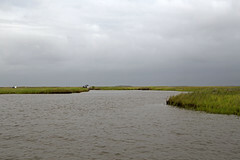 The Coastal Wetlands Planning, Protection, and Restoration Act encourages the connection between students and the coast by providing the opportunity to become “hands-on” with activities that foster interests in and curiosity for Louisiana’s passive shoreline environments. Among the 70 exhibits from universities, non-profits, state and local governments, student clubs, science and museum centers and K-12 student exhibitors was the CWPPRA Mysterious Wetland Wonders activity. Participants were encouraged to reach inside the seven mystery boxes, read clues, and try to identify the wetland item hidden inside each box without peeking! The mystery items included a seashell, apple snail shell, oyster shell, cypress knee, Spanish moss, nutria pelt, and a magnolia seed pod. In order for future generations to effectively protect our oceans, coastlines, and wetlands, learning about the importance and benefits of each is essential.